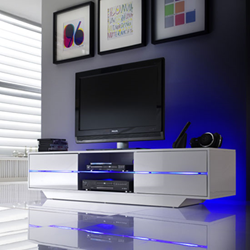 Sienna TV stands, which are popular for flat screens, have been introduced by Furniture in Fashion. TVs have been a part of the living rooms for decades now. These come in a variety of sizes, styles, and designs which one can choose as per the size of the TV and other requirements. These units have also served as spaces for displaying photographs or other ornamental objects. With the old CRT TVs having been replaced by the flat screens, you also need to have a TV unit which is minimalist and as fancy as the flat screen. Hence, one such exceptional TV unit which has been launched by Furniture in Fashion is the Sienna TV stands. Sienna TV stands are specially made for Flat screens and are most ideal for Plasma, LCD and other HiFi units. These stands are mainly available in the colours of black or white which are embellished with LED lights and a glass shelf. These LED lights have the quality of changing colour as per the adjustments being made. This light changes to flash, strobe or it fades as per the setting. This elegant and attractive unit has four drawers which can be easily opened and closed with the push open function. The Sienna TV stand has been made from high quality MDF and honeycomb board panel and has 8MM safety glass. This unique quality entertainment furniture unit is made in Germany and is available at a very affordable price. The dimensions of this unit are width 160cm, depth 40cm, and height 36cm. You have an option to order it as flat pack or as an assembled unit which might cost some extra pounds. Having something unique is always desirable, and this Furniture in Fashion strives to achieve with every product of theirs. Sienna TV stands are exclusive pieces which are not available with many furniture vendors, thus giving Furniture in Fashion an edge over the others. Thus, it seems that the main objective of Furniture in Fashion is to achieve maximum customer delight by providing unique and desirable products to the customers. These kinds of units help you in bringing elegance into your living room and enhancing the beauty of your TV with the use of such kind of TV units. However, before the purchase is made, it is very necessary to assess what all entertainment devices this unit must accommodate. It would be wrong to assume that all equipment would fit. Thus, measure the dimensions of your electronics, especially devices like DVD player and gaming consoles which would ideally be placed on the shelves or drawers. Sienna TV units would definitely give your living room the feeling of exclusivity, but however if this is not what suits you then browse through various ranges of TV stands and entertainment units and choose the one which suits you the best.